Upon arrival, your loved one is logged into our tracking system and assigned an identification number. This number is used to track every phase of the cremation process. Our tracking system includes date and time of arrival at our facility and name of the transfer technician. Personal belongings are catalogued and placed in a secure area for their return to the family. 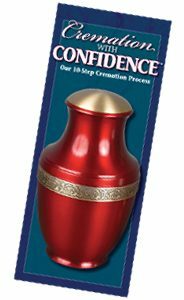 We will ask you, or a representative, to positively identify your loved one prior to cremation. You may also authorize the Medical Examiner’s identification to be acceptable for ID purposes if you so choose. Two individuals, a cremation technician and a funeral home staff member, will review all cremation paperwork and permits. This is to ensure authorization and permits have been properly documented. Once all documentation is verified, both staff members must sign the cremation order prior to the cremation. Immediately prior to the cremation process, your loved one is taken to our private crematory and their personal identification is noted in our cremation log book. This log shows the name of the individual, date and time of the cremation, identification number and crematory operator’s name. Our crematory log is dated and the start time is noted and initialed by a cremation technician before and after the cremation. One advantage of choosing a funeral home with an on-site crematory is the ability to participate to the extent you desire. We offer a private viewing room to families so that the cremation process can be witnessed. The crematory checklist and identification card are placed on the outside of the cremation chamber during the cremation process. After the cremation is complete, the cremated remains are placed into an urn. The identification card is placed into our permanent files. Our staff will notify you to schedule a time for receipt of the cremated remains. At this time, we will provide a dignified setting in which to receive the urn, where you may spend a few moments, privately, in quiet reflection.